Heat oven to 325°F. Spray 2 cookie sheets with nonstick cooking spray. In large bowl, combine butter and sugar; beat until light and fluffy. Reserve 2 tablespoons of the pistachios. Add remaining pistachios, flour and vanilla; mix well. Dough will be stiff. Divide dough evenly into 4 pieces; shape into balls. On lightly floured surface, pat each to form 6-inch round. Place rounds on sprayed cookie sheets. With table knife, lightly make indentations on surface of dough, dividing each round into 8 wedges. In outside edge of each wedge, insert 1 pretzel half for tree trunk. Bake at 325°F. for 16 to 21 minutes or until edges are light golden brown. Cool 2 minutes; remove from cookie sheets. Cut each round into 8 wedges; place on wire racks. Cool 15 minutes or until completely cooled. Very finely chop reserved 2 tablespoons pistachios. In small bowl, blend icing ingredients, adding enough milk for desired drizzling consistency. Drizzle icing in zigzag design over each cookie. 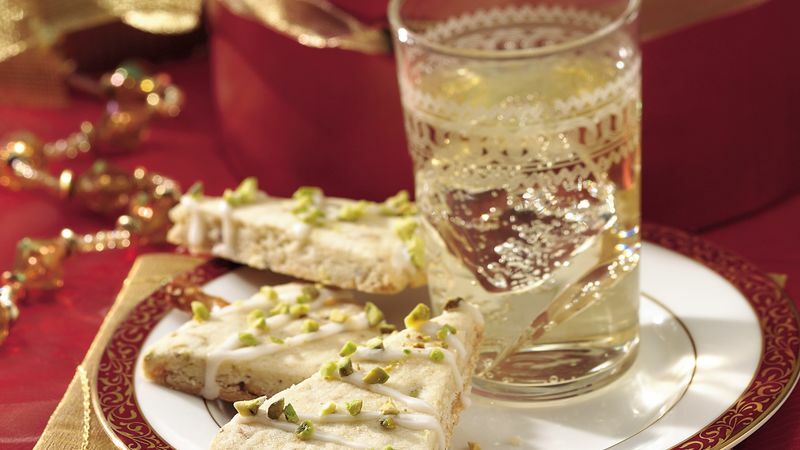 Before icing sets, sprinkle cookies with reserved pistachios. If baking 2 cookie sheets at one time, switch positions halfway through baking. Pistachio nuts are easy to shell because the shells open naturally when the nuts are ripe. Discard unopened pistachio nuts; they are not ripe. Shelled pistachio nuts are more expensive, but they save prep time. Look for them in the grocery store produce department near the bulk nuts and dried fruit. To transfer the dough round to the cookie sheets for baking, use two large pancake turners.